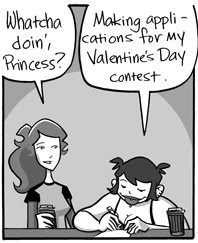 Webcomics writers are a bunch of cynics, but Valentine's Day is the holiday that melts even the hardest heart, right? Eh...not so much. 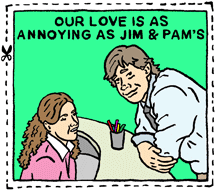 Randy Milholland at Something Positive proves that Valentine's Day awkwardness can strike in the most inappropriate of places. He's also got a lovely Darwin Day ecard. At Zach Weiner's Saturday Morning Breakfast Cereal, a couple's competition to convince each other to break off the relationship takes an unexpected turn. Partrick Alexander's Hilarity Comics notes that anatomical differences can make romance a bit squicky in Marioland. If you want to share your anti-Valentine's sentiments with the offline world, Brian McFadden at Big Fat Whale has a series of clippable V-Day cards sure to leave your significant other in tears. But it's not all tearing down the romantic notions of others. Box Brown's ode to couple love Bellen! is as full of strangely sweet sappiness as ever. Instead of a fractured Valentine, Randall Munroe's xkcd goes for fractal Valentine, tranforming a Sierpinski Triangle into a sea of hearts. Danielle Corsetto held a contest for readers of Girls with Slingshots to go on a date with bubbly second banana Jamie. And Hazel gets a V-Day subplot with her current beau. Corsetto also has printed Valentine's cards for those looking to get a jump on next year. Meredith Gran has octopus pie-themed cards as well, so you can convey that perfect romantic sentiment be it "I'd Even Love You Sober" or "I'll Tell You Whatever You Want to Hear." Valentines are sold out at Diesel Sweeties, but it's still worth heading over to see R Steven's unique, bacon-flavored take on the holiday. Plus, he probably has the only Valentine specifically aimed at Nihilists. David Malki at Wondermark has an appropriately WTF ecard, and plugs AwkwardValentines.com, which offers a bounty of illustrated cards perfect for that person you're looking to alienate via email. Haul these folks all over by using significant gucci replica design and style plus generate a design and style report for yourself. Displaying a different collection of set purses and handbags, Assots offers any rationale in making this fantastic get which will you may have continually sought. Gals with mid plus gucci replica great world can’t manage to pay for to think about moving away from their home with out using fine handbags. People wish to currently have several dyed purses and handbags of your style and design people for instance so they can transport several purses and handbags by using prada replica several dyed attire. In this, the most wonderful thing how they conduct is definitely get general purses and handbags out of suppliers that create eye-catching commodity with purses and handbags accessories. Other than the following, quite a few as well pick is an excellent shopping for them with the chanel replica search who has fine commodity and give all these purses and handbags on sale. Most important basis to do hence will be to lower the buying price of any handbags so they can help you save quite a few element of capital that have to shell out once they moved to get retail price browsing which will burberry replica doesn’t lets profit. As well as web-shop thatbagshop is an example of Online TOP RATED 500 preferred internet dior replica dealers, hard unveilings innovative plus cool and trendy purses and handbags collection agencies month for month.